An independent monarchy until 1974, Sikkim is a small mountain state with the Kanchenjunga looming on the horizon. The state is well known for its simplicity and peaceful nature. It is famous for Kanchenjunga, which is the third highest mountain in the world standing at 8586m. This mountain state offers up a lot of variety in wildlife and plant life, aside from an ethnic mix of people which is diverse and rich with cultural tradition. Beautiful lakes, ancient monasteries, great food, excellent trekking and friendly people make Sikkim a wonderful destination in the North East. 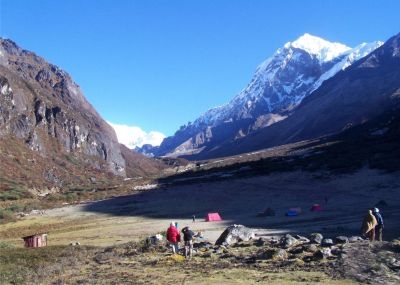 Trekking will surely make your Sikkim tourism a special experience. For anyone who loves hiking, Sikkim is the perfect place. The journey from Yuksom to Dzongri Peak, and then on further to Goecha Peak if you are up for a challenge, is the most popular path to hike in Sikkim. It goes through forests which are unspoiled, wonderful gardens of rhododendron and the powerful rivers of Kachenjunga National Park. There are additional trekking permits which foreigners must get. These can be obtained at Tourism offices in Gangtok, or you can contact the Sikkim House in Chanakyapuri, New Delhi. Sikkim is known to be a wonderful place for meditation, which is heightened by the fact that there are almost two hundred monasteries which dot the divine hilltops. They hold many festivals at the monasteries, especially around Losar in February and March. 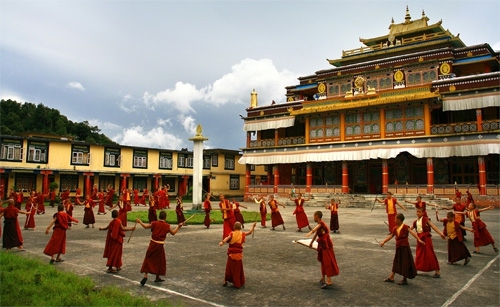 In July, Tse Chu features Buddhist dancing at Rumtek. Enchey holds a Chaarm festival in December and January. 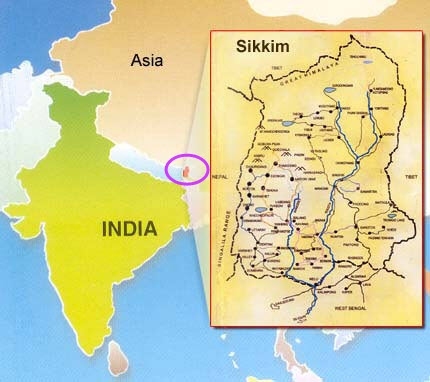 Yuksam was the first capital of Sikkim, and according to records of history, the first Chogyal of the Kingdom of Sikkim was consecrated in 1641 AD by three lamas. The evidence for this is still intact in the form of stone seats and foot prints of the Head Lama on a stone in Norbugang. These areas are now thought to be sacred by the people of Sikkim since the history of this State started in this place. Yuksam is served from Pemayangtse by all-weather roads, at a distance of 32kms from Yuksam. The newest adventure activity to come to Sikkim is river rafting, and the Teesta River gives you some of the best opportunities. The main route is Makha-Sirwani-Bardang-Rongpo. Interspersed with placid patches you can float on are grade two to four rapids, and there are all kinds of sandy white beaches to use for overnight camping. Gorges and high cliffs, plus river beds strewn with boulders, give you even more thrills. With its more turbulent waters, the Rangeet River also gives you advanced rafting opportunities from Sikip-Jorethang-Majitar-Meli. 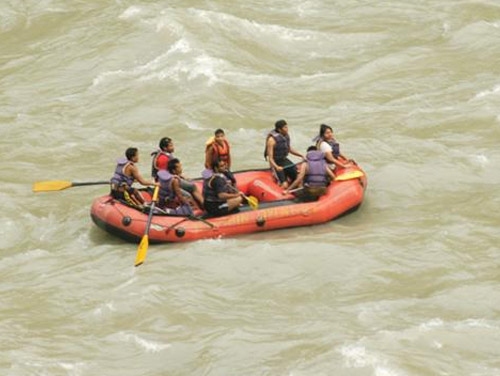 The best times for rafting in Sikkim run from March to May and from October to December. Renowned for its amazing variety of animals, birds and flowers, Sikkim has over four hundred species of butterflies, over 450 species of birds, over 40 species of rhododendron and 450 varieties of orchids. The Deorali Orchid Sanctuary in south Gangtok and the Kyongnosia Alpine Sanctuary are two of the best places to see all of these. It is best to go from March to early May and the end of September to early December to the Deorali Orchid Sanctuary and from June until October to the Kyongnosia Alpien Sanctuary. For those who are really feeling adventurous, there is nothing that compares to a journey along the former Old Silk Route to Nathu La, which is three hours from Gangtok along the border of China. There is just one barbed wire fence that creates the border, and you will get the weird thrill of looking on the other side and being able to see Chinese soldiers. Only Indians, unfortunately, are permitted to travel this far however, and just on Wednesdays, Thursdays, Saturdays and Sundays. You need to have a permit, which you can get through a registered travel agency. When it comes to Sikkim tourism, Gangtok is a place one should not miss. The capitol of Sikkim, Gangtok is a melting pot of ethnicity with a mix of Lepchas, Tibetans, Nepalis and Bhutias. The Buddhist monasteries here are brightly colored and are scattered over the landscape with amazing views of the Kanchendzonga visible in the background. There are plenty of things to do and see, including the Enchey Gompa, the Ridge, the Namgyal Institute of Tibetology, Changu Lake and Nathu la Pass. The best time to go is after the monsoons in April through May and in October. The only tea which exists in the State makes one of the top quality teas that can be found in the international market. The tea garden spreads over a gentle sloping hill which originates from the Tendong Hill and gives a wonderful view for the villages that are surrounding. If you are interested in learning methods for processing tea, a visit to the factory is in order. A rewarding experience could also be a visit to the garden if you want to combine culture and nature. A night spend in a British bungalow located right below the tea garden is also an exciting experience that links the past and the present. 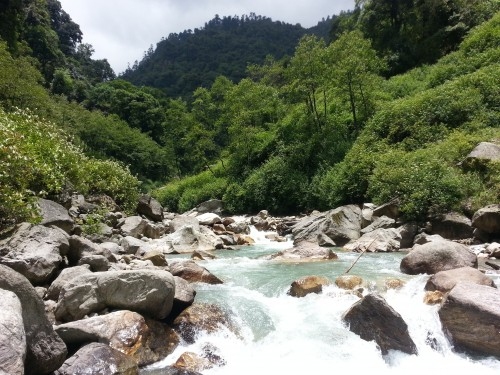 Nature is one of the most striking features of Sikkim tourism. At an elevation of 11,800 feet and 140 kms from Gangtok, Yumthang is a nature lover’s paradise with a wonderful blend of fauna and flora plus scenic grandeur that is breathtaking. There are a large variety of Rhododendrons and other alpine flowers. Tsa-Chu is a hot spring found on the left bank of Lachung Chu which is extremely popular for its properties of curing and healing. For both domestic and foreign tourists, the Yumthang package tours are set up solely by registered and local travel agents. At right around 40km from Gangtok, this serene lake is found at an altitude of 3,780 meters. It is around 1km long and is oval in shape, plus it is 15 meters deep and is thought to be sacred by the locals. It stays frozen during the months of winter up to the middle of May. Between May and August, you can see a variety of flowers in bloom, which includes the rhododendrons, several species of primulas, yellow and blue poppies, iris and more. It is a perfect habitat for the Red Panda as well, plus varying species of birds. It is open for both Indian and foreign nationals. Server responsed at: 04/18/2019 11:15 p.m.